What are some of the things that make us proud to be Canadian? Some might answer ‘free health care’ or ‘hockey’, especially for most Winnipeggers. One study from 2016 revealed that 17.1 million Canadians were “really proud” about our “freedom to live as we see fit”. 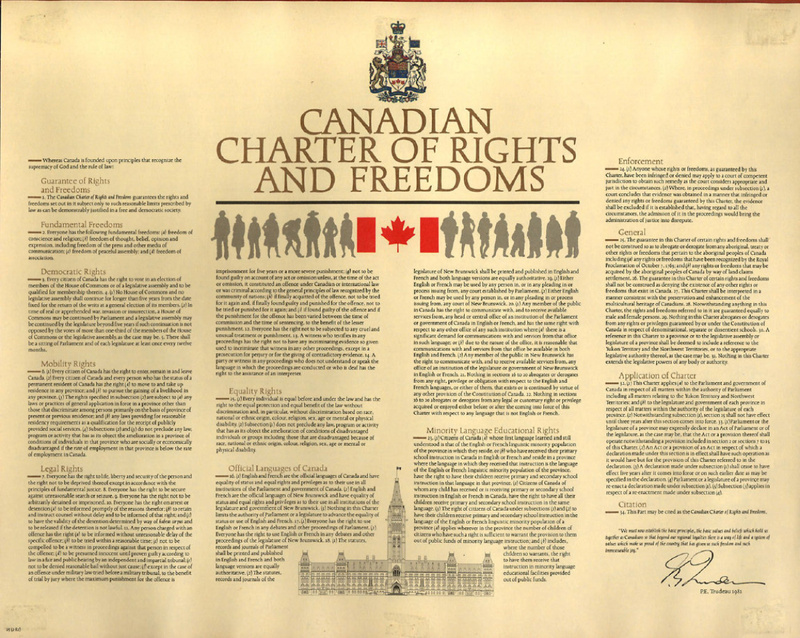 A main source of Canadians’ rights and freedoms is the Canadian Charter of Rights and Freedoms. The Charter is entrenched in the Canadian Constitution, which ensures that the government does not unreasonably interfere with these rights. The Charter became a significant part of our country’s laws and shaped our identity as a nation. However, some Canadians do not know or tend to forget that the Charter’s guarantees are not absolute. The Charter contains an exception that allows legislatures to pass laws that may nonetheless violate certain Charter rights. This exception is found in Section 33 of the Charter. How did it come about in the first place? What exactly does it do? Why should we care about it? In 1982, after tense negotiations between the federal government and the provinces, the Constitution was patriated and the Charter was entrenched in the Constitution Act, 1982. Section 33, commonly known as the notwithstanding clause, was included in the Charter as a compromise on the part of Prime Minister Pierre Trudeau. Some provinces feared that the entrenched Charter would allow the Courts to override laws enacted by the legislatures, which might disrupt of the balance of power between the Courts and the government. In order to provide assurance to those provinces, the clause was suggested at the First Ministers Conference in 1981 as a “safety valve” and included during the final constitutional negotiations. Ultimately, the addition of the clause ended the political deadlock that preceded the Charter’s entrenchment. G.W.J. Mercier, Attorney General of Manitoba at the time of the First Ministers Conference, said that the clause would be used to “identify, define, protect, enhance and extend the rights and freedoms Canadians enjoy”. Some anticipated that the clause would be used to enable legislatures to correct unacceptable judicial interpretations of the Charter. The section’s purpose is to provide legislatures with the power to override certain protections found in the Charter, including the fundamental freedoms of religion, speech, assembly and association (Section 2), legal rights (Sections 7-14), and equality rights (Section 15), by expressly declaring that the legislature is enacting the legislation notwithstanding the Charter’s provisions. This public declaration presents an opportunity for public discussion and debate. However, the section does not require a legislature to specify which provisions of an Act it believes violate the Charter nor does it require to the legislature to provide a justification for using the override. Section 33 provides that legislation can only be enacted notwithstanding the Charter for a period of five years. After five years, the declaration ceases to function. Once the declaration expires, the particular legislation would be vulnerable to Charter challenges unless the declaration is renewed. This time limit provides a second chance for decision-makers and the public to engage in dialogue about the legislation’s impact after the previous five years. It is therefore important that Canadians know that such an exception exists and when it is used. After all, laws that infringe on our rights and freedoms could drastically affect how we live. The notwithstanding clause has been invoked by provincial and territorial governments a handful of times since it was introduced. Quebec and Alberta have used it as a means of protest. As recently as 2018 Saskatchewan used it to ensure funding for non-Catholic students to attend catholic schools after that practice had been deemed unconstitutional. It is alarming that there have been circumstances where the clause was used in a way that it deviated from its intended purpose. In 2018, recently -elected Ontario Premier Doug Ford decided to invoke the clause when a court held that Ford’s legislation to reduce the size of Toronto City Council from 47 to 25 during an election campaign was unconstitutional. The Better Local Government Act was deemed unconstitutional by the Ontario Superior Court of Justice as it “undermines the overall fairness of the election”, which is “antithetical to the core principles of our democracy”. Since the Ford government was a majority government, the clause could be invoked without procedural opposition within the legislature. Ford discussed his use of the clause, saying he planned “to do what it takes to ensure that this law — which has already been passed once — is reintroduced, voted on and passed again on the quickest possible timetable”. Ultimately, Ford withdrew the Act and did not invoke the notwithstanding clause after the Ontario Court of Appeal overturned the original judgment. If the notwithstanding clause was successfully invoked in this case, the Act would then be protected from judicial challenges based on the Charter. This would have prevented persons affected by the re-writing of Toronto’s election law from challenging a law in court that resulted in overpopulation per ward and may ultimately undermine effective democratic representation. Ford also announced that he would not hesitate to use the notwithstanding clause in the future. An examination of Section 33’s history and past usage allows Canadians to consider its potential future use. The notwithstanding clause has been used in the past and will continue to affect us today. We cannot know when legislatures will use the power of the clause and potentially threaten to limit our rights. Canadians, therefore, must be aware of the existence of Section 33 to ensure that the clause is not misused by our elected politicians. Do you think the notwithstanding clause offers fair limitation to the Charter or does its presence provide the potential for harm?